Renowned for being the artistic center of Bali, as well for its relaxed atmosphere and stupendously green surroundings, Ubud is one of the most recognisable locations in Bali and the beating cultural heart of the island. This ancient royal town is scattered with art studios and shops that specialize in niche craft. Upon arrival at your hotel, head out on the Ayung River and laze the afternoon away with a foot bath and massage. As you float down the river, you will be serenaded with the sounds of exotic birds and the breeze rustling through the trees. When you reach the shore, enjoy high tea in the jungle and make your way down a path to a village temple for a blessing ceremony. Once your done, walk back to your hotel to unwind before dinner. Bali Asli is an off the beaten path restaurant and cooking school in East Bali known for its traditional Balinese cuisine. The cooking classes, hosted by Executive Chef and Director, Penelope Williams, are based on “a day in the life of…”. 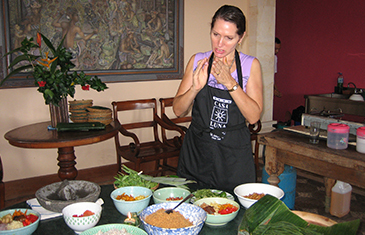 Every class focuses on the cuisine from the different regions of Bali with a varying theme. This secluded restaurant is peacefully situated at the foothills of Mount Agung and surrounded by rice fields. Bali is synonymous with spiritual and physical wellness, and in turn, has become a prime destination for those seeking restorative experiences. Upon arrival at The Royal Pita Maha, you will trade your clothes for a sarong and sash. Then, walk to the hotels main temple to pray and experience a purification ceremony at the Holy Spring Pool. Enjoy an organic lunch made with locally sourced produce and later, proceed to the Royal Kirana Spa & Wellness centre. There, you can choose from a myriad of rejuvenating spa treatments and massages. The centre also includes an herbal steam sauna as well as a swimming pool. Balinese people have enormous reverence for their Hindu religion, as well as their surroundings, and the creatures they share the earth with. This is reflected in the temples, pagodas and animist statues that are omnipresent on the island. Today’s tour begins with a stirring lecture at the private home of Bapak Anong Ishmail, the curator of the Sukarno Museum, we will then travel out into the hills to visit and learn about the Buddhist and Hindu temples that were erected in the 8th and 10th century. On the way, stop for lunch amongst the lush paddy fields and meet a local priest who will conduct a blessing ceremony. This ceremony is performed to wish you luck and health in your future endeavors. Beyond the electric green paddy fields and rugged jungles, Bali is a kaleidoscope of colours. This is especially true at the flower and fruit market. On your way from Ubud to Jimbaran, make a pit stop and admire the incredible bouquests, wreathes and necklaces constructed from flowers and leaves. Afterwards, stop at Ulun Danu Temple located on the banks of serene Lake Bratan – one of the most photographed spots on the island. Near the lake, is a small restaurant serving delectable Balinise cuisine and is a perfect place to relax with a beer and absorb the enchanting surroundings. The cave at Goa Gong is off the beaten path and not widely known by most tourists. As you descend the rock staircase, you will be greeted by two dragon statues. It is said that the dragons returned to their native cave by Dang Hyang Nirarta on his way back to Pura Peteng centuries ago and have remained there ever since. Local Hindus come to this place daily to pray and preform “purification” rituals. Upon entering, there is an air of tranquility and spirituality at every turn. Feeling suitably enlightened, head to Sundara Beach Club at the Four Seasons Hotel and bask in a dazzling sunset. 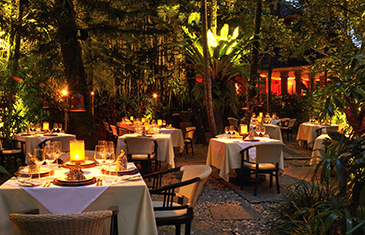 Then, head to Cuca Restaurant, regarded as one of the premier dining destinations in Indonesia. The water surrounding Lembongan Island is a striking shade of blue. 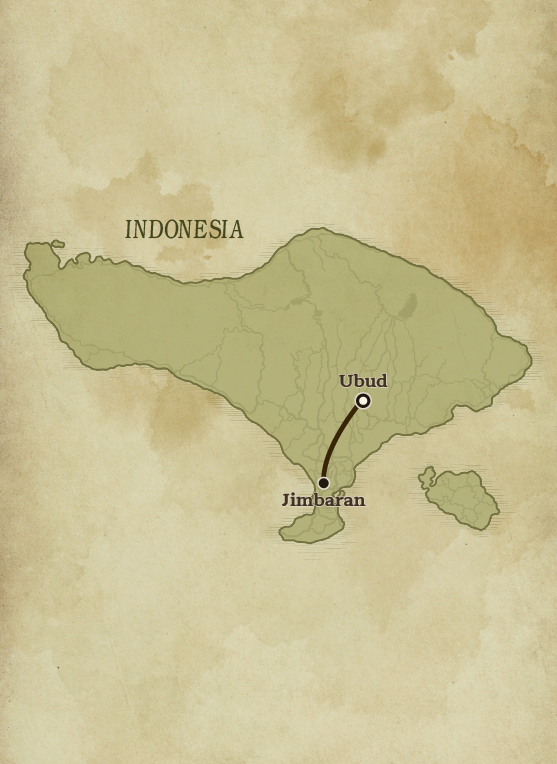 Situated off the southeast coast of Bali, the island is free of motor congestion and hawkers. The quiet atmosphere has made the island a desirable distination for tourists seeking halcyon beach vibes. Vibrantly colourful coral reefs have also made the island a noted spot for scuba-diving and snorkeling. After enjoying a swim in the sea, head back to the shore for a delicious barbecue of steaks and freshly caught seafood. By late afternoon, it will time to sail back and enjoy the sunset on board your luxurious catamaran. This paradise island offers countless places and activities to share, enjoy and create happy memories. Explore far-flung regions, indulge in a spa treatment or a romance-fuelled al fresco dinner. You could also simply enjoy your resort base, Jimbaran Village, on Bali’s south-west coastline. A traditional fishing community, Jimbaran rests in a 5km (3mi)-long crescent-shaped, golden sand bay, one of Bali’s finest stretches of beach. Although Jimbaran has increasingly become a popular resort destination, it still maintains its distinctly Balinese village ambiance. During your ‘alone time’, enjoy a day of sun worshipping, paddle out in the bay on a kayak, or dine again at Jimbaran’s celebrated beachfront seafood restaurants. Transfer to Denpasar International Airport for your onward flight.